People had heard of Jesus – maybe his miracles, his preaching – and were drawn to want to see him. Maybe they wanted some sort of cure or other help from him. They approach those who knew him and asked. When Jesus was told people wanted to see him, he digressed a bit and talked of his coming death and resurrection. 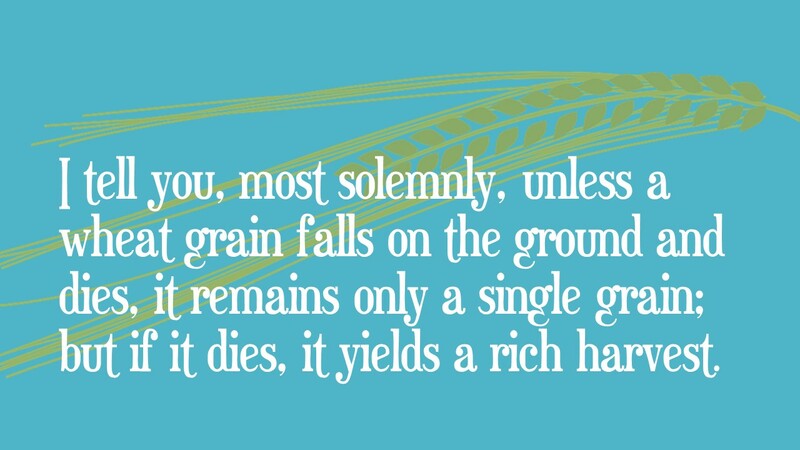 He would be seen when he was ‘lifted up’ in death and suffering, and this ‘grain of wheat’ will ‘yield a rich harvest’. We cannot see Jesus fully unless we look at the crucified Lord. Then we see that this is love to the end, in service to his people, move us to live as best we can in his way of life and follow his path. Jesus presents this call to us even from the cross to serve him. The season of Lent brings us into closeness to him, in both being with him and sharing his love and compassion in our world. Whatever we do for Lent is to benefit others – whether in giving time, praying for them, caring for the needy in many ways. As we come close to holy week, we realise that the week is holy, not only because of Jesus, but because of the many people who have tried to follow him in their lives. We are grateful for them and ask to be among them. This entry was posted in Gospel of John, Gospel Reflection, Liturgy Resources, Prayer Resources, Scripture, Year B and tagged Donal Neary SJ, Faith, Gospel Reflection, Gospel Reflection for the 5th Sunday of Lent Year B - March 18th 2018, Jesus Christ, John 12:20 -30, Love, Sunday Gospel Reading and Reflection.